// Getting the stink eye from my furball - she's too cozy to get up. // Love being outdoors this time of year, especially at Franklin Park Conservatory. // Need to add a plaid scarf to my fall wardrobe! // More white room interior inspiration - I can never get enough, this kitchen is to die for. // Perfect fall walks with Deedee - sporting her favorite sweater of course! Find it here on Etsy if you're interested! Handmade with your dog's specific measurements and such amazing quality! We need to order a new one, this one is a year old and getting a bit too tight. The photo of your trip to the conservatory is beautiful!!! I loved the DeeDee-in-sweater shot! I'd love to go to Scotland so I'm sorry you couldn't go this year (and also jealous you've been before ha). Nice sweater Deedee! I've finally jumped on the plaid trend-and I'm lovin it! That pup sweater is so cute! mmmm buttons i need some please. yum. 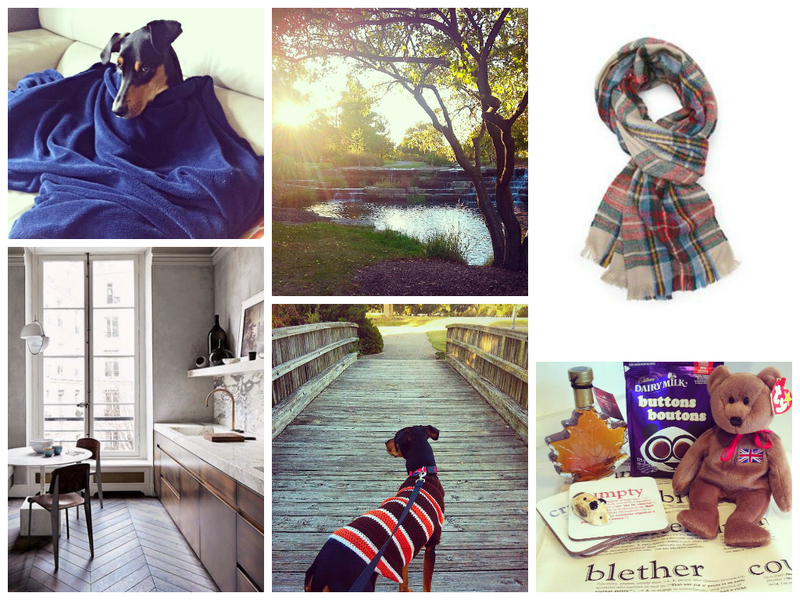 i'm still dreaming of a plaid scarf, sigh..
Aww LOVE the pics of your sweet Pup! Deeds is so cute! And that park looks perfect! Love the scarf and goodie from scottland!